We are excited to win a Fearless Photographers Award (collection 43)! This photo was the top 2% of over 8,000+ images that were submitted! The Fearless Photographers are considered a collection of “THE BEST WEDDING PHOTOGRAPHY IN THE WORLD”. We are incredibly honoured to be a part of such a special group of photographers and look forward to submitting more photos for awards! This photo took place at Andrea and Tyler’s Rockwater secret cove wedding. Their wedding ceremony was in a unique location on a dock, while all the guests scattered on the rock cliffs. On the descent down the aisle (dock) after the ceremony, the wind picked up, the brides veil flew off her head, and the officiant tried to it from blowing away. 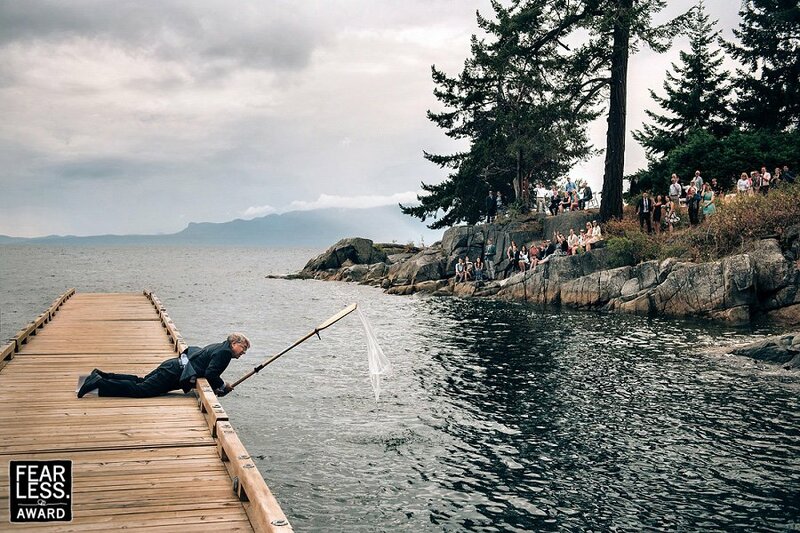 Although a little wet, he managed to save the bride’s veil from sinking into the ocean. You can view the original Fearless awards post here. See more award winning images!